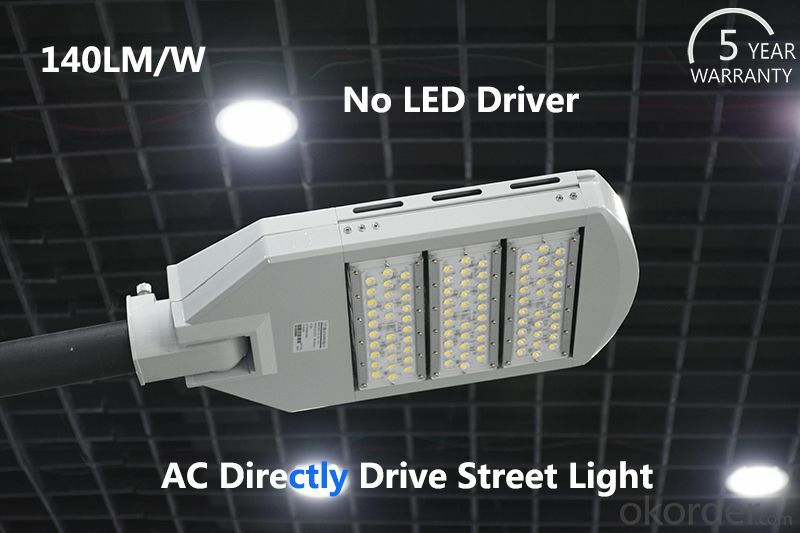 Wholesale AC directly drive LED Street light high Luminous Efficiency no driver Product from China Supplier at Lighting.Okorder.com. Ref Price : $352.00 - 387.00 / set Click here to get a QUOTE TODAY by typing in the quantity and leave your specific requirements. 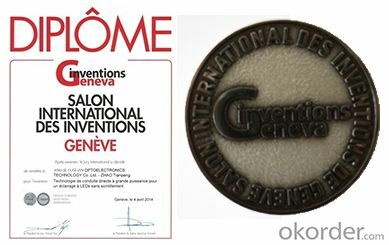 We possess the world leading AC directly drive technology and globally unique three-phase power directly drive patented technology which won the award of the 2014 Geneva International Exhibition of Inventions. As the leader of advanced lighting technology in China, Yushan will guide the new trend of no driver LED in the world. TF11 is a chip which is specially designed for the output of voltage change of the AC electric supply in LED lighting. It can adjust the quantity of loaded LED to realize the efficiency and power factor LED driving solution. G13 is the Integrated circuit which is special for the control of over current and over voltage. According to the change of voltage, G13 could ensure the stability of LED, improve the reliability and durability of LED. The TF11&G13 AC directly drive integrated circuit totally replaces the traditional LED driver, it realizes a reliable and high efficiency LED AC drive system. The traditional drivers of LED are easy to damage, which becomes the biggest technical defect which decreases the service life of LED. At the same time, the high manufacturing cost is also the main factor which increases the cost of LED. The no driver design of Yushan LED radically reduces the damage rate of LED, greatly improves the reliability of lightings. Yushan LED adopts AC directly drive power solution ,it discards the external LED power driver which seriously affects the service life of LED light. So the service life and stability of LED were greatly improved that are more than 10,000 hours (more than 8 years), twice as long as that of general street lights. 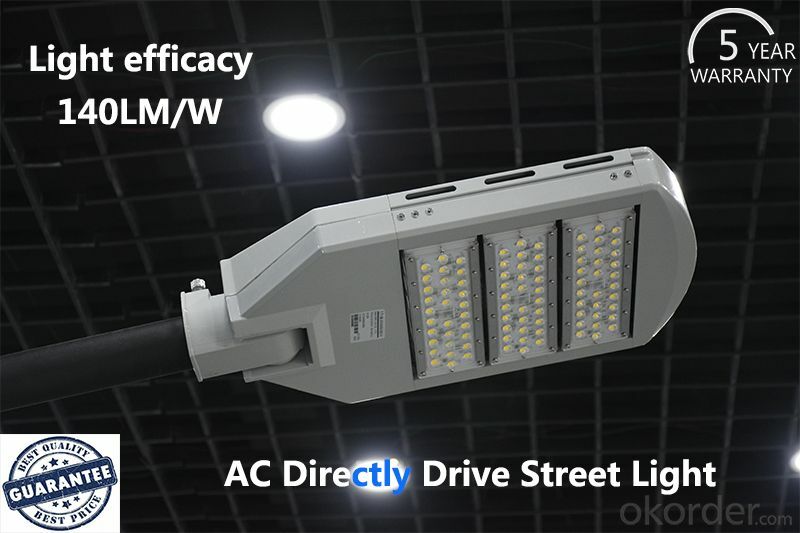 Our company could provide the longest warranty of LED street lights in the market. Remove the transformer, MOSDET, electrolytic capacitor and other components which restrict the life of the driver. So the service life of AC directly drive circuit can reach semi-permanent state that surpasses the LED luminous source. At the same time, the volume of AC chipset is much smaller than traditional driver. Have over current, over voltage, reverse connection protections, which ensures the service life and stability of products. Globally unique three-phase power AC directly drive technology. The creative three-phase power AC directly drive technology ensures that the street lights could access the AC160—380V electric supply directly. This could reduce the line reconstruction of the traditional electric transmission line, it will save a large cost in the street light projects. Choose high quality luminous resources that the light efficacy is more than 170LM/W. The luminous efficacy of our street lights is more than 50% comparing with general street lights. We provide the most energy-efficient street lights in the world to our clients. The LED chips are encapsulated through multicrystal method so that the rate of dead lamp declines to a lower level. The Luminous Attenuation of the whole light is less than 3%.The total Luminous Attenuation in 8 years is less than 20%. Yushan Photoelectric is the first manufacturer in China who supplies the LED street lights under 3000K color temperature. 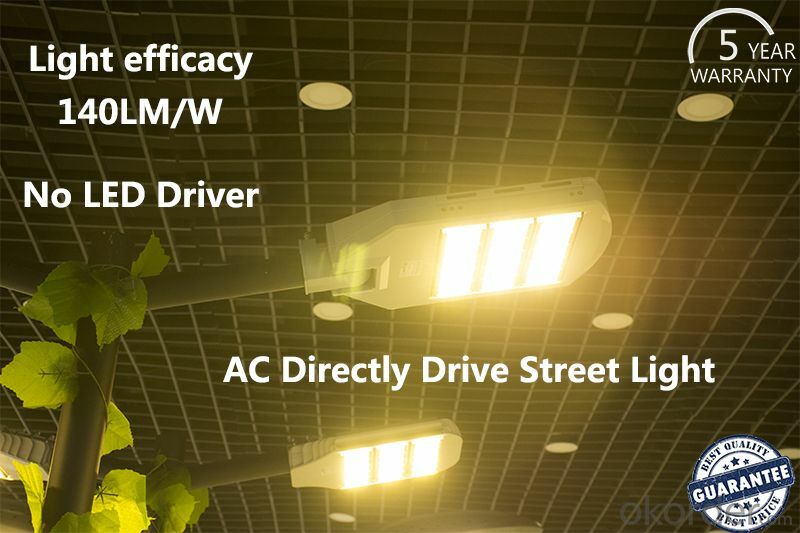 The color temperature of street lights covers 2800-6500K, but the light efficacy is more than 140LM/W, it is a world leading level. The low color temperature light could excellently penetrate the rain and fog, so the LED light could perfectly replace the the high pressure sodium lamps. Utilizing the ZAG lens technology developed by USTC, the gap between the lens of light distribution and luminous source was filled by the colloid that ensure there is no air in the gap. This technology could realize the transmittance without light loss. Comparing with general products, the light efficacy of our LED is increased by 7%, the transmissivity reaches up to 99.8%. According to the statistical data of LED errors, the percentage of the faults caused by circuit structure is 20%. The percentage of the faults caused by driving power is 70%. 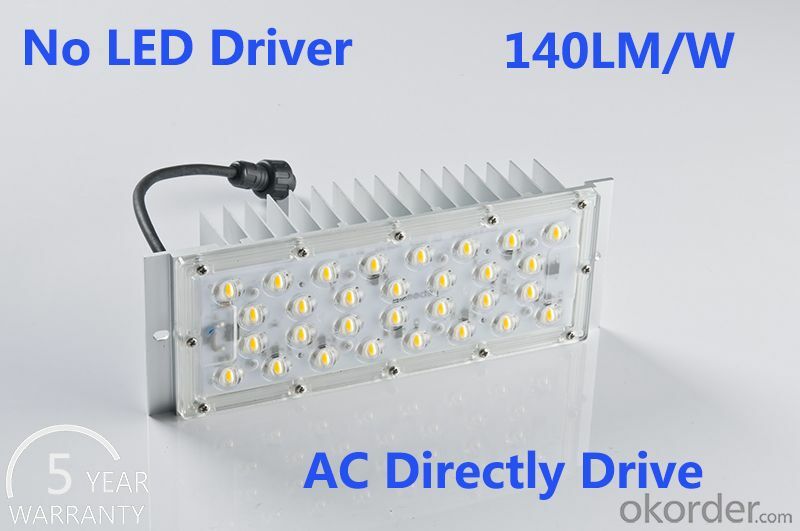 Thus it can be seen that the LED driver is the most important factor to decide the quality of LED lights. Patented fin type heat sinking technology which follows hydromechanics theory: the temperature rises less than 20 Celsius. Adopt the heat sink structure with air flue which is wider at the top and narrower at the bottom, this structure forms the space for air flow that pulls hot-air out of the bottom. It accelerates the flow velocity and cools the lights more rapidly that keeps the LED luminous source in the most comfortable situation. Modularized design (encapsulated by 30-45W high luminous efficiency module).The design needn’t the maintenance by tools, the replacement is easy like replacing a bulb. There is a stepless dimming interface on the module which is available for the smart lighting service. Save much more 70% electric energy than traditional high pressure sodium lamps, save much more 50% electric energy than general LED lights. The LED without driver reduces the reactive power loss (the driver consumption near 12% of total).So the power is more sufficient and the luminous efficiency is higher. Use a power of 120W Yushan AC LED Street light to replace the high pressure sodium lamps which uses 400W or general LED street light which uses 185W. Compare with high pressure sodium lamps, Yushan LED street light could save 1312 kilowatt hours per year. Compare with general LED Street lights, Yushan LED street light could save 260 kilowatt hours per year. Your message must be at least 20 characters.